• The 540 joules surge protection rating offers voltage suppression not available with the average power strip. Advanced X3 metal oxide varistor in a fire-retardant ceramic casing uses high energy dissipation to absorb excess voltage. Safety shut-down technology uses built-in thermal fuses to power-off the connected equipment when any extended over-voltage is detected or at surge protection end-of-life. An EMI/RFI filter reduces AC line noise and radio frequency interference. A diagnostic Protected LED verifies protection at a glance so problems are noticed quickly. • Protect, power, and re-charge your devices at one centralized location. 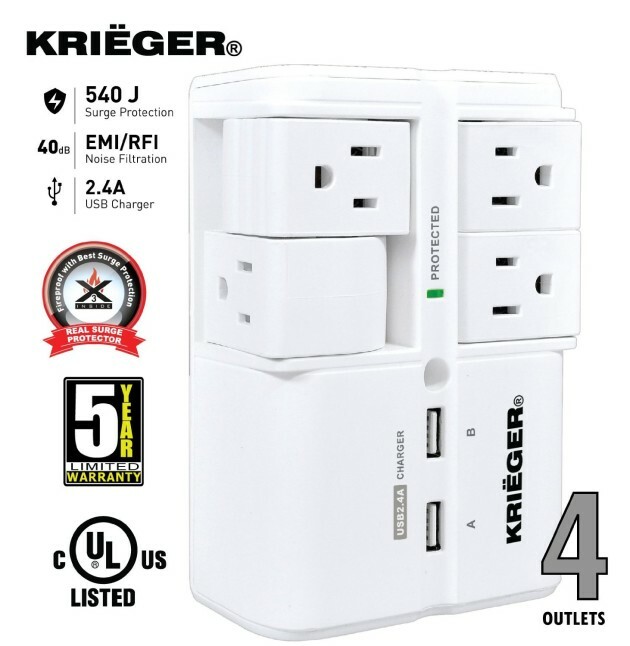 The four outlets each rotate 90 degrees to accommodate both power cords and adapters and 45 degrees to activate the dust shutters and block unwanted access. 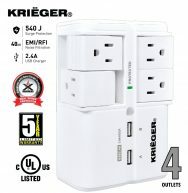 A smart design allows connections to all the AC outlets without blocking the USB ports.